This is a guest post by Bethany Snyder of Snyder Strategies. These can be frightening words for some nonprofits — but they shouldn’t be. Most nonprofits, from community groups to social justice organizations, are focused on providing resources and solutions to some of our toughest issues. You’re housing the homeless, feeding the hungry, saving animals, children, babies, and families — helping people meet their basic needs. This is important work — extremely important. But it doesn’t afford you the you the time or space or energy that is needed to focus on how to solve these issues. However, you have the knowledge, expertise, and real life experience to help solve these tough problems. You see the solutions, you see the possibilities, but you need space and guidance to get this info to the right people — the people who make decisions about laws and policies. Advocacy affords you the opportunity to use your expertise to help solve big problems. By engaging in advocacy, even in small ways, you can help find solutions to the toughest issues our society faces. You can even use this strategy to raise more money! Want to find out how, and what you can do to help? In this post, I’ve detailed what exactly advocacy is (and isn’t) and six easy steps you can start following today to get more involved in making change happen. First, let’s get on the same page about what advocacy is (and is not). Advocacy is communicating with and mobilizing the general public to contact their lawmakers about a specific issue. Advocacy can include direct lobbying, but does not solely involve lobbyists and lawyers. Advocacy is not politics, which involves elections, candidates, and political parties. However, advocacy is influenced by politics. I encourage you to think about advocacy as a donor engagement tool. It is another opportunity to bring your donors and supporters closer to your mission. Advocates are 7 times more likely to donate to your organization than non-advocates. In 2017, the response rate to advocacy messages was 2.2%, compared to only 0.06% for fundraising appeals. Connecting a fundraising appeal with an advocacy initiative can potentially triple the amount of donations you receive. Just like events, activities, and fundraisers, advocacy is another way to educate your donors and supporters about your mission and involve them in solutions. I could write a whole blog post about the myths and barriers that contribute to why organizations don’t engage in advocacy. 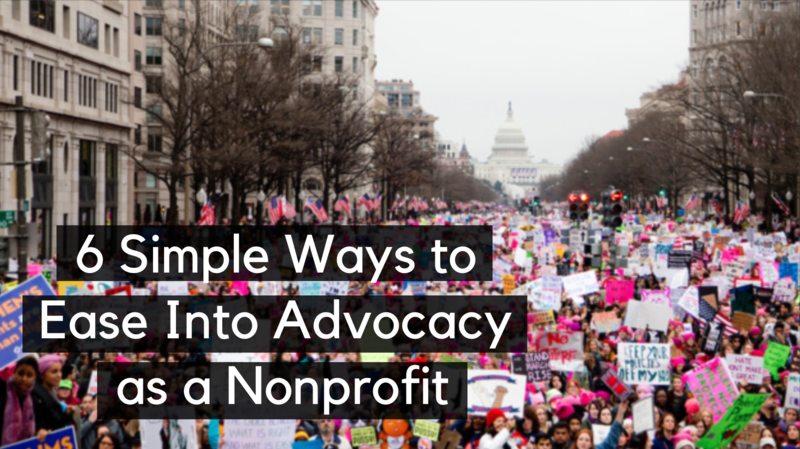 But once you decide it’s worth it, you’ll see that getting involved is easier than you think — and here’s how you can start easing into nonprofit advocacy today. Organizations often don’t jump into advocacy because it seems so daunting. Where do we plug in? Do we need to hire a lobbyist? I don’t even know where the Capitol is (just kidding). So, I recommend starting small. Find a coalition meeting you can attend. Convene a small group of donors to explore their legislative relationships. Get your organization to join a sign-on letter. Find a small, meaningful step you can take that makes sense for your organization, donors, and community. 2. Focus on These Kinds of Activities. Your organization has its place in your community and movement. Do you provide direct services? Are you a donor powerhouse? Do you have strong corporate engagement? Compelling stories? Look at your staff, your leaders, your board of directors, donors and supports to identify your strengths. Identifying your strengths will help you figure out how you can best participate in advocacy. For example, if your organization provides direct services, you can share the voices and stories from those impacted by your services and program. Or if you have strong corporate relationships, you may be able to leverage these in an advocacy capacity. By identifying and playing to your strengths, you’re more likely to be able to successfully integrate and leverage advocacy. Advocacy rarely succeeds in a vacuum. Honestly, I can’t think of a time when a single organization successfully changed a law or public program to benefit those that rely on it. Although that might initially seem frustrating, it’s actually a huge opportunity, because it means there are plenty of seats at the proverbial advocacy table. So, start by finding out which organizations are leading the public policy charge in your sector and join forces with them. Who has the lobbyists? Who runs the coalitions? In addition to strengthening the coalition and ensuring they are representing multiple voices, you can also learn from them. Listen to the discussions, hear the strategy ideas, and find the possible policy solutions. With this information, you’ll be better able to figure out how you can participate in the policy solutions and engage your donors and supporters. 4. Engage These Members First. Your leaders set the direction and tenor of your organization and determine how staff spend resources and time. So, to successfully engage in advocacy — from the staff level to the donor level — your organizational leaders need to be on board. If you’re not the Executive Director, or Board President, you need their buy-in. If do you lead your organization, then convene a group of your “loudest” or most active donors or supporters to see if they’re excited about dipping their toes in advocacy. By engaging your leaders, you will be able to inspire and excite others across your organization — and ultimately be more successful. 5. Start Doing This From the Beginning. By engaging in advocacy, you will be able to collect more data about your donors and supporters. This will help you engage them in more meaningful ways — and raise more money. After you figure out the data you want to collect, start tracking right away! This could be a simple spreadsheet of board members’ relationships with lawmakers, or the coalitions in your community. By getting something on record, you’re more likely to implement it and pay attention to it. You can also start seeing trends, patterns, and opportunities to further engage your donors. You also want to think about how you will measure success and how you will report this back to your stakeholders. How will you know you are making a difference? How will you know if your advocacy efforts are impacting your fundraising efforts? As you embark on your advocacy journey, tracking your efforts will be critical to tracking your success. 6. Get This In Order First. To leverage advocacy for fundraising properly, you need to make sure you have systems in place. Does your current CRM have the functionality you need? If you want to grow, what systems will you need? How are you currently tracking donor information and activity? Can you figure out how to easily capture additional actions? What data do you want to capture? Even if your systems aren’t currently capable, can you determine a path to get yourself there? By taking the small step to think about your data and systems, you can begin to chart how you can collect — and use — all the data you need to be successful. Engaging in advocacy does not need to be scary or daunting. Plus, it can strengthen your organization and your relationship with your donors and supporters. So start easing your way into advocacy — and you’ll start seeing the impact on your mission and bottom line. 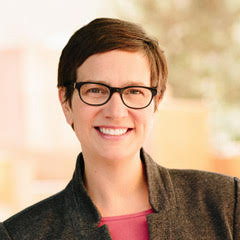 Bethany Snyder is owner and founder of Snyder Strategies and works with organizations across the country to improve and enhance their advocacy efforts to leverage their people power. Your choice of image for this post is disturbing. To feature an image of a so-called “women’s march” serves only to alienate your customers. The event pictured is nothing but a leftist, man-hating bunch of pro-abort hypocrits who exclude women with differing values. Watch out, Wild Apricot, your true colors are showing. Better to keep your public face out of divisive politics and keep your focus on providing business services. In my business, I speak my mind with my wallet. Is it time for me to look elsewhere for member management? The choice of image for this post was not done with any political impulse in mind - it was simply meant to represent advocacy in action. My apologies that it offended you!